Updated at 6:48 p.m. Eastern. A Libyan plane carrying 104 people crashed Wednesday on approach to Tripoli's airport, leaving a field scattered with smoldering debris that included a large chunk of the tail painted with the airline's brightly colored logo. A 10-year-old Dutch boy was the only known survivor. The Dutch prime minister said everyone on the Afriqiyah Airways Airbus A330-200 arriving from Johannesburg, South Africa, was killed except the child, whose survival was hailed as a miracle. A 10-year-old Dutch boy lay in a hospital bed in Tripoli, head bandaged. Little was known about the dark-haired boy, who was rushed to a hospital in Tripoli where he underwent surgery for multiple fractures in both legs. The barely conscious child muttered "Holland! Holland!" after he was found, a Dutch official said. Libyan TV footage showed the boy, one eye bruised and swollen closed, breathing through an oxygen mask with multiple intravenous lines connected to his body and a monitor at his bedside. Doctors later said he was out of danger. The Royal Dutch Tourism Board said 61 of the dead came from the Netherlands, including many holidaymakers who had been on package tours to South Africa. Dutch flags were lowered and campaigning for the June 9 parliamentary elections was suspended in respect for the dead. Hundreds of people phoned emergency numbers to ask about family and friends while authorities at other destination airports set up crisis centers. "We are sad and sore at the thought of the more than one hundred passengers and crew who lost their lives," the Anglican Archbishop of Cape Town, Thabo Makgoba, said in a statement. "We thank God for the sole survivor. In his survival, we see that even in this dark cloud of death, there is this ray of hope." The crash left a large field scattered with small and large pieces of plane debris and dozens of police and rescue workers with surgical masks and gloves, some of them carrying at least one body away. They gathered small personal items such as wallets and cell phones from the wreckage. Others sifted through debris - some of it still smoldering - including a flight recorder and green seats with television screens on them. 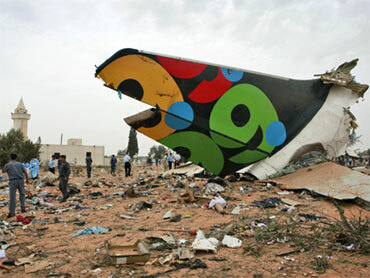 A large piece of the plane's tail was visible, bearing Afriqiyah's brightly colored logo with the numbers "9.9.99," a reference to the date of the founding of the African Union. The plane was carrying 93 passengers and 11 crew, Afriqiyah Airways said in a statement. "Afriqiyah Airways announces that our flight 771 had an accident during landing at Tripoli International airport," the statement said. "Authorities are conducting the search and rescue mission." The Libyan government has ruled out terrorism, but the cause of the crash remains unknown, reports CBS News correspondent Richard Roth. There was no volcanic ash and the weather was clear. Libyan Transportation Minister Mohammad Zaidan confirmed the sole survivor was a 10-year-old Dutch boy. A Dutch Embassy official planned to visit the survivor in the hospital later Wednesday, said Foreign Ministry spokeswoman Ozlem Canel. She said officials were still trying to verify his identity. The Libyans "say and think it is a Dutch child, but that must be determined by our colleague," she said. An unnamed doctor, speaking in Arabic in the Libya TV video, said the child "has several breaks in both legs and is under intensive care but is stable." The head of the European Parliament Jerzy Buzek said the boy's survival was "truly a miracle." Besides the Dutch, the other victims were French, German, South African, Finnish, British and Libyan, according to the transportation minister. The plane was approaching the airport in the Libyan capital Tripoli when it crashed at around 6 a.m. There was no immediate word on the cause, according to a statement by the airlines posted on its website. The company that runs the Johannesburg airport said the flight departed at 9:37 p.m. local time Tuesday. The airline said Tripoli was the flight's final destination, although many of the passengers were booked to travel to other destinations. Johannesburg is a popular tourist destination and the flight came when many Dutch schools were closed for the annual spring break. "This is a large group of Dutch nationals after all, so it's a deeply sad message we have this day," Dutch Prime Minister Jan Peter Balkenende said. The aircraft that crashed was delivered from the production line in September 2009. It had accumulated approximately 1,600 flight hours in some 420 flights, according to Airbus. Weather conditions over Tripoli's international airport were good on Wednesday, with three-mile visibility, scattered clouds at 10,000 feet and winds of only three miles per hour. A NASA Web site said an ash cloud from Iceland's volcano had reached North Africa by Monday, but a map from Britain's meteorological office showed it was well west of Tripoli at the time of the crash. Brussels-based European air traffic management agency said the thinning volcanic ash cloud that disrupted air traffic over parts of Europe and the Atlantic in the past few days had moved into mid-ocean and was unlikely to have affected an airliner in Libya, more than 2,000 miles away. Daniel Hoeltgen, spokesman for the European Aviation Safety Agency said Afriqiyah has undergone 10 recent safety inspections at European airports, with no significant safety findings. He said a team of French crash investigators was already on its way to Tripoli. "We are currently talking to Airbus and with the French accident investigator BEA, which will be involved in the investigation," said Hoeltgen. "We will lend our support if this is required by authorities in charge." Afriqiyah Airways is not included on the European Union's list of banned airlines. The list has nearly 300 carriers deemed by the EU not to meet international safety standards. According to initial reports, the plane crashed as it neared the threshold of Tripoli International's main east-west runway, while preparing to touch down from the east. The main runway at Tripoli Airport is 3,600 yards long. According to international airport guides, the airport does not have a precision approach system that guides airplanes down to the runway's threshold, but has two other less sophisticated systems that are in wide use throughout the world. Wednesday's crash was the fourth deadly landing accident at Tripoli airport in the past 40 years, according to the Web site of the U.S.-based Flight Safety Foundation. In 1970, a Czechoslovak Airlines Tupolev 104 crashed 3.4 miles from the airport, killing all 13 people on board. A year later, a United Arab Airlines Comet crashed 4.5 miles from the runway threshold, killing all 16 on board. In 1989, a Korean Air DC-10 crashed, killing 75 of the 199 people on the aircraft. Afriqiyah Airways operates an all Airbus fleet. It was founded in April 2001 and is fully owned by the Libyan government.